This holiday season, I’ve been making a ton of DIY Christmas crafts. 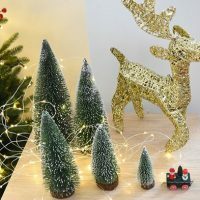 I’ve focused on a few themes—easy DIY Christmas projects, rustic Christmas craft ideas, and miniature Christmas trees. 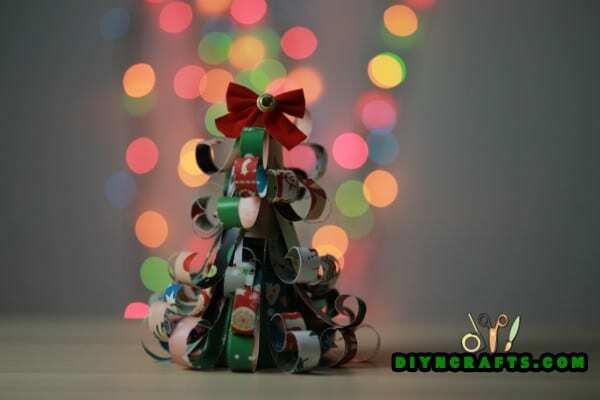 My latest video tutorial teaches you how to make a miniature Christmas tree using some cardstock. It’s a really simple project which anyone should find easy to do, but the results will take your breath away. I got the idea for this project because I purchased a whole bunch of Christmas cardstock last year, and I had a bit left over. I was experimenting with the cardstock, and figured out that it could easily be used to create an effect like Christmas tree branches. Wouldn’t you know though—I ran out of the Christmas cardstock by the time I finally got the idea figured out. I thought about buying some more, but I had a bunch of plain cardstock, and it was easy enough just to print the patterns myself to make my own materials. 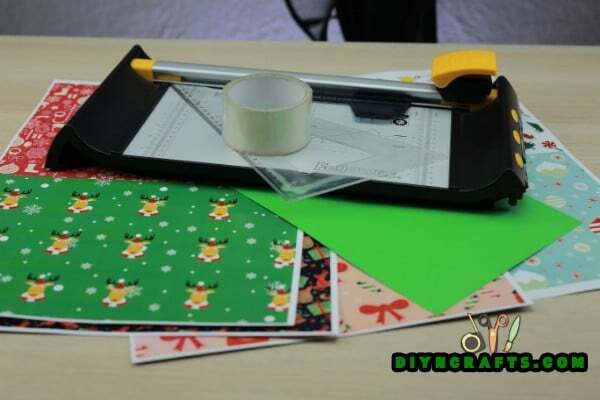 So I would say that Christmas-themed cardstock is the best supply for this project, but if you don’t have any (or the cardstock you found isn’t printed on both sides), the best solution is just to create your own. Can you use cardboard or wrapping paper? You could try, but I think that the cardboard might be too thick to bend properly (unless it is very thin cardboard similar to cardstock). As for the wrapping paper, it probably would work all right, but it would be tough not to crinkle it, and it wouldn’t store well. Construction paper might work if you print patterns on it (after all, you will use it for the core of the tree). Ready to get started? Below, you can view the list of materials and tools which you will need to turn this crafting project into a reality. You can also view a list of written instructions to accompany the video. 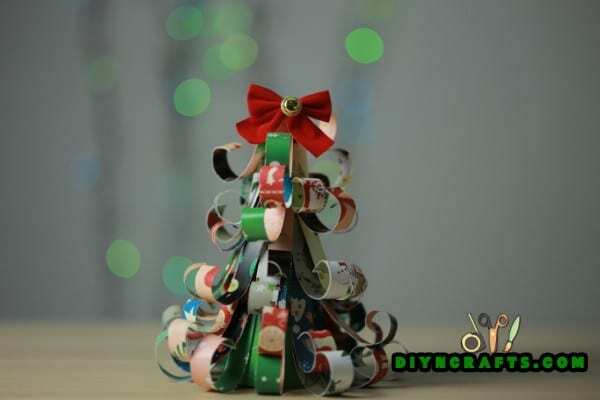 Love the idea of making your own DIY Christmas decorations this year? 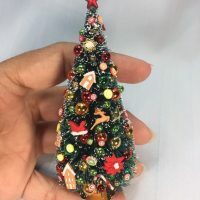 If you are looking for a cool idea for making a miniature Christmas tree, you are going to love the latest project we have in store for you. 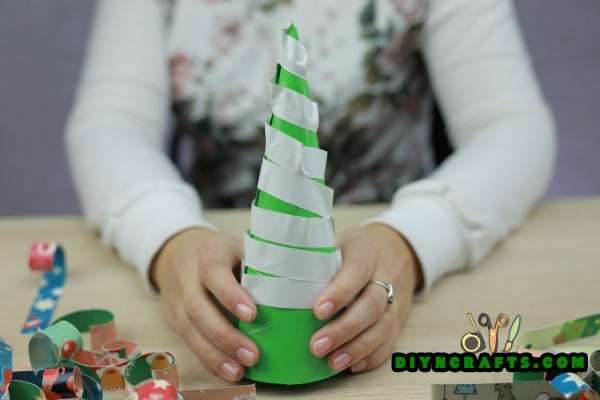 This video tutorial teaches you how to make a Christmas tree out of plain old cardstock! First, get your Christmas-themed cardstock, cardboard, or paper ready (see the introduction above if you need some advice). Remember, it must have patterns on both sides. 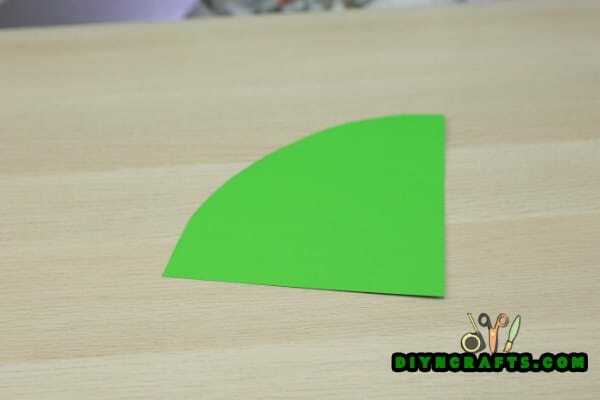 Get a piece of green construction paper and a drafting triangle. Use the drafting triangle to guide you as you make a series of marks to draw a curve. The curve should extend from one corner down to about two-thirds of the way along the opposite longer edge. Once it is completed, you should have a shape with two straight edges which are equal in length and a curve extending between them. This is difficult to describe using words alone, so watch the video to see what I mean. 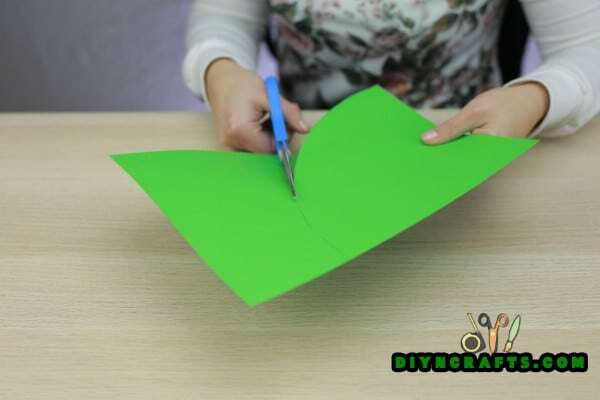 Use your scissors to cut out the shape along the curve. 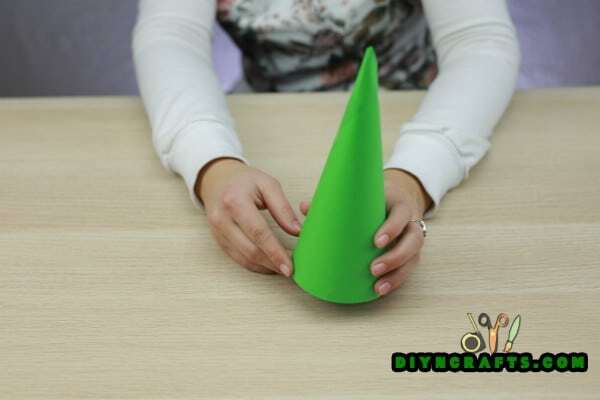 Next, fold the shape into a cone and tape along the edges to join them together. Next, you will need to get the strips of cardstock ready. I made my strips to around 2 cm in width, and cut them to varying lengths: 5 cm, 7 cm and 10 cm. I give you these numbers simply as an example. It is actually up to you how long and wide you want to make them. You can base this off of the size of your Christmas tree as well as your aesthetic preferences. You can use a variety of different patterns, just a couple, or even just one if you prefer. The next step is to curl the ends of all of the strips of paper. You will only curl one end of each, not both. Grab a pencil or pen and use this to assist you in the curling. Next, you need to attach double-stick tape around the outside of the cone. If you have actual double-stick tape from the store, definitely use that. It is the easiest solution. If you don’t happen to have any, you may be able to apply masking tape instead and then peel the paper portion off to result in double-stick tape. Just be really careful while doing this or you will damage the construction paper. 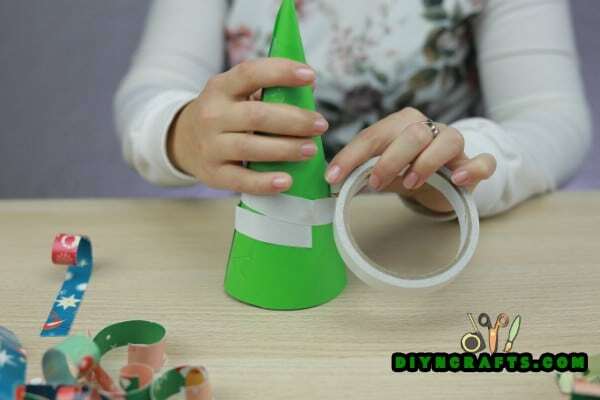 After you have applied the tape to your cone, start attaching the cardstock pieces, working in a circle around the base of the cone. Attach them by the ends which you did not curl with the pencil. The curled ends should project downwards and out. 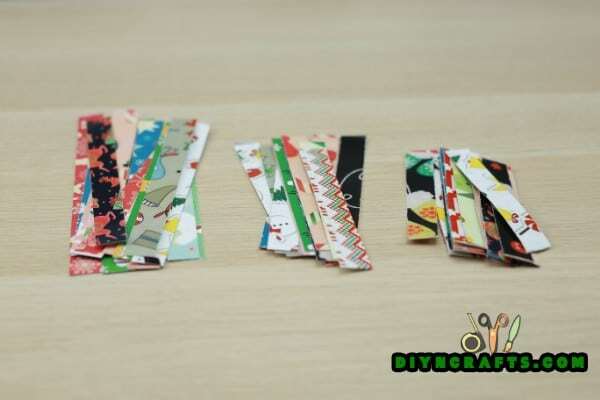 A short distance above the first layer of cardstock strips, start working your way around and attaching a second layer. Continue doing this all the way up to the top of the tree. The final step is to attach some sort of ornament to the very top of the tree. 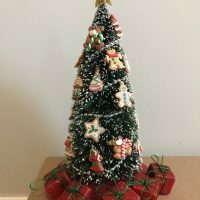 This completes this easy DIY miniature Christmas tree crafting project. The finished result of this project is astonishingly colorful. It also looks fairly elaborate. But as you now know, it is actually quite a simple craft to put together. As far as storing this ornament goes at the end of the season, you’ll have to be particularly careful. I would put it in a box—or better yet, a plastic bin. That will provide superior protection. 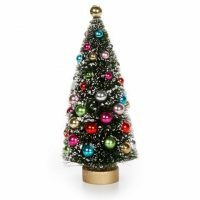 Surround it with packing material, but do not pack it in too tightly, or the packing material itself could deform the tree. Loose tissue paper or bubble wrap should work. You can create a bunch of these trees in different shapes and sizes and a variety of colors and printed patterns. Display together or scattered throughout your home, they can help create a festive atmosphere. They can make nice gifts as well, but you’ll probably need to hand them directly to your recipients in person so that they do not get damaged in a gift box or while being unwrapped. If you had fun with this project, do not miss out on some of our other exciting video tutorials. 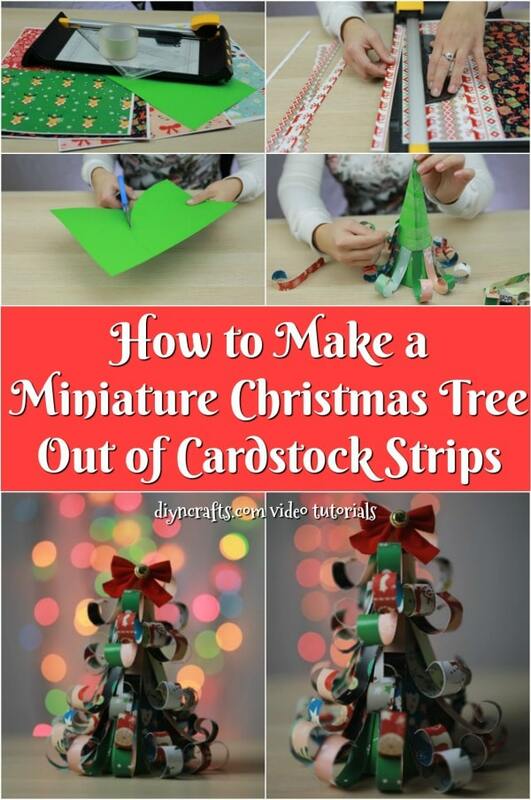 You have learned how you can turn strips of cardstock into a miniature Christmas tree. 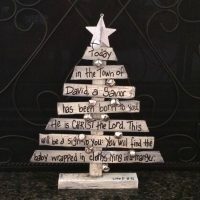 Next, try transforming an old book into a Christmas tree. You can also discover how to build a Christmas tree out of pine cones. 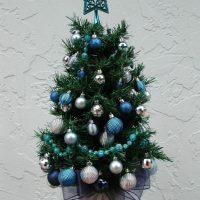 You can even learn how to make a miniature Christmas tree out of a real sprig of pine. ‘Tis the season for crafting joy and miniature Christmas trees galore!